Congratulations to Snap Trap, the GameSalad Game of the Month for December! 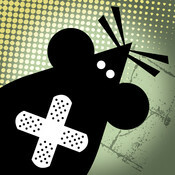 Developed by John Tommervik of 8 Bit Grenade, Snap Trap is a fun and challenging puzzle game. The premise is simple. 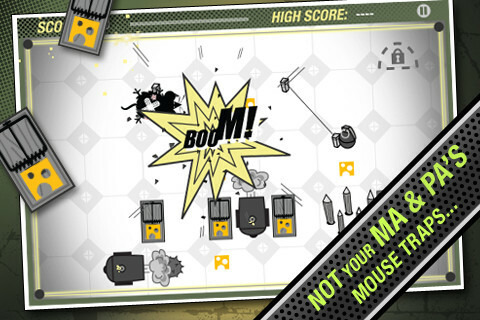 Players guide a mouse through a treacherous maze of cheese, traps and spikes. Collect all the cheese and you will unlock a mouse hole for your escape to the next level of puzzle fun. Your score is based on how fast you move through each maze. Don’t let its simple premise fool you, the game is challenging and a great deal of planning and strategy will go into defeating the 30 demanding levels. Snap Trap has a little bit of something for every gamer. It falls under the category of an action iPhone game, arcade iPhone game, strategy iphone game and even iPhone puzzle game elements as well. We cannot recommend this game more highly. Download it today on the iTunes App Store for $2.99. GameSalad recently sat down with Tommervik to talk about his background, the development of Snap Trap, and that awesome summer where he met P Diddy and Corey Feldman(among other things). GameSalad: Hi John! Thanks for taking time to talk with us and congrats again on Game of the Month. Starting off, can you tell us a little bit about your background? Tommervik: My background is in graphic design, art direction, photography, interactive design, seo/internet marketing, copywriting, photography and music composition. GameSalad: What were you doing before you discovered GameSalad? Tommervik: I have been running my own advertising and design freelance business, (www.johntommervik.com) for the last 5 years. Even though I live in Honolulu, most of my business relationships are with clients in Los Angeles and New York. I have been working on some side projects such as an online travel guide to Amsterdam (www.letshavefuninamsterdam.com) which is based on my travels and experiences. GameSalad: How did you first get interested in game design and development? Tommervik: In the late 80’s, all of my friends had the latest video game consoles – everyone except for me. When my parents weren’t looking, I would “borrow” a couple of quarters and sneak out to the local arcade. When I got home, I would have nothing to satisfy my newfound addiction. My solution was to make board games, of the same games I played in the arcade. Translating arcade games into board games taught me quite a bit about game design. GameSalad: How and when did you first discover GameSalad? Tommervik: I discovered GameSalad at the end of my interesting and random summer of ’09, after I ran into a black bear on a backpacking trip with my Dad, met Diddy (P. Diddy, Puff Daddy) after he sprung the security alarms trying to catch his flight in Atlanta, hung out with Corey Feldam after his premiere of Lost Boys 3 in San Diego, and almost stepped on a rattlesnake in Eastern Washington. Short answer: I discovered GameSalad while browsing the internet. When I discovered GameSalad, all I could think was “FINALLY. Someone finally created a program where you could create a video game from scratch with no programming experience.” From the very beginning I was really amazed at the power. GameSalad: Did you have any previous programming experience before picking up GameSalad that summer? Tommervik: Using Flash Actionscript, CSS, and HTML were the only coding experience I have had before Gamesalad. GameSalad: What kind of games have you made with GameSalad? Tommervik: All kinds. 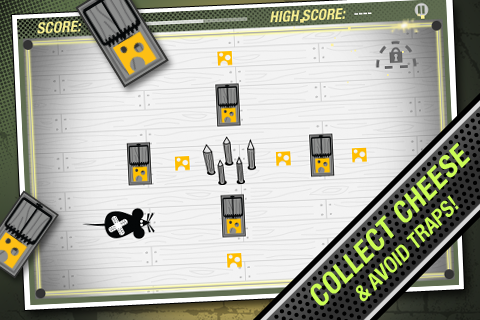 Snap Trap is an arcade style puzzle game. The next game 8 Bit Grenade is working on is a simulation of sorts. The third one will be an listed under the action genre. GameSalad: We love Snap Trap at GameSalad. What kind of success have you seen with it so far? Tommervik: To date, Snap Trap has done better than expected and has been received very well. Most of this was done using press releases, social networking, seo, viral marketing, and email marketing. I believe Snap Trap also has a perfect 5 star rating on the app store. GameSalad: Last question. What inspires your game development? Tommervik: Getting away from my work inspires my game development. Anytime I am away from everything, I tend to come up with the best ideas, whether it is traveling, going for a hike, or catching some waves.